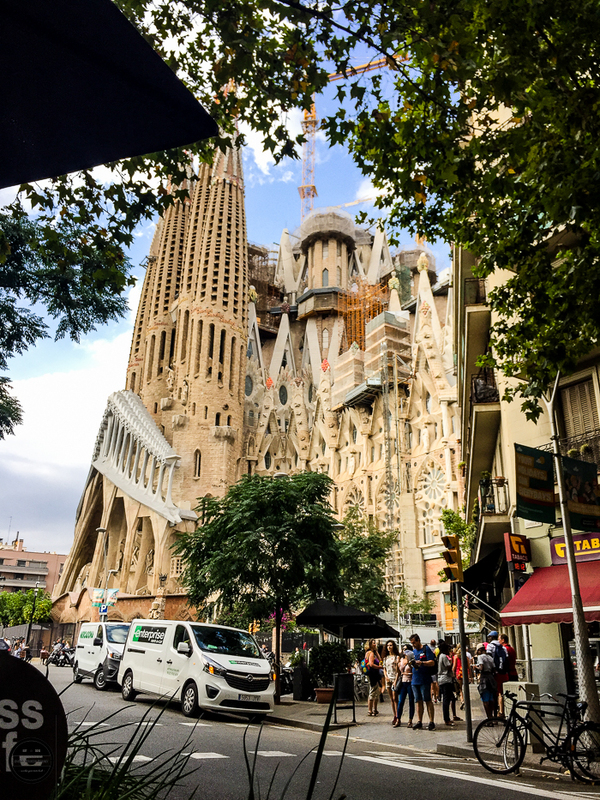 Jagruti's Cooking Odyssey: Barcelona - my unforgettable 3-day vacay! I'm already into August having found myself with no summer plans. After a gruelling year at uni and the last long summer holiday of my life, there was only one thing for it - booking a girls trip away! I am a medical student in my clinical years meaning I now will not get the luxury of many weeks off but just a fortnight. 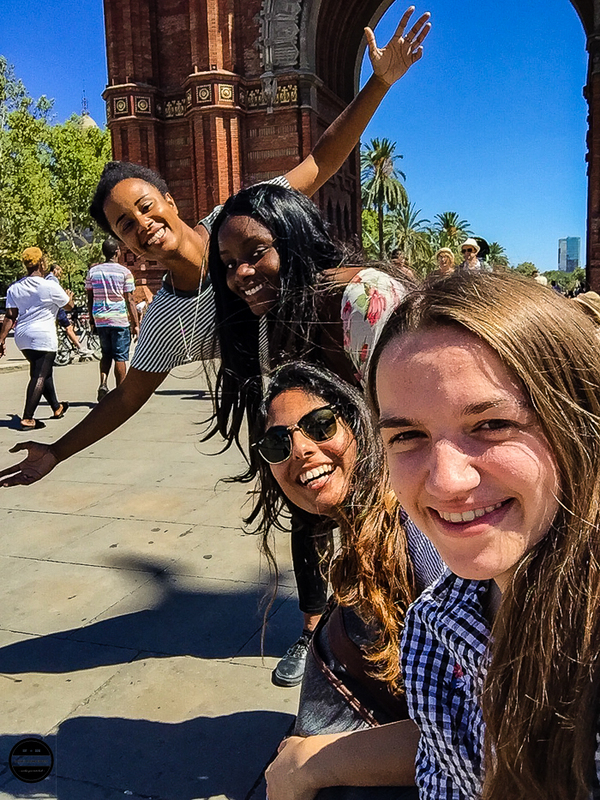 With some hasty last minute decisions, I and my friends landed on Barcelona and got to work planning our 3 days there. I hadn't really considered Spain as a holiday destination much before even though it is an absolute tourist hotspot. I heard from a lot of friends that they had booked flights to Barcelona and now that I have been there, it is easy to understand why. 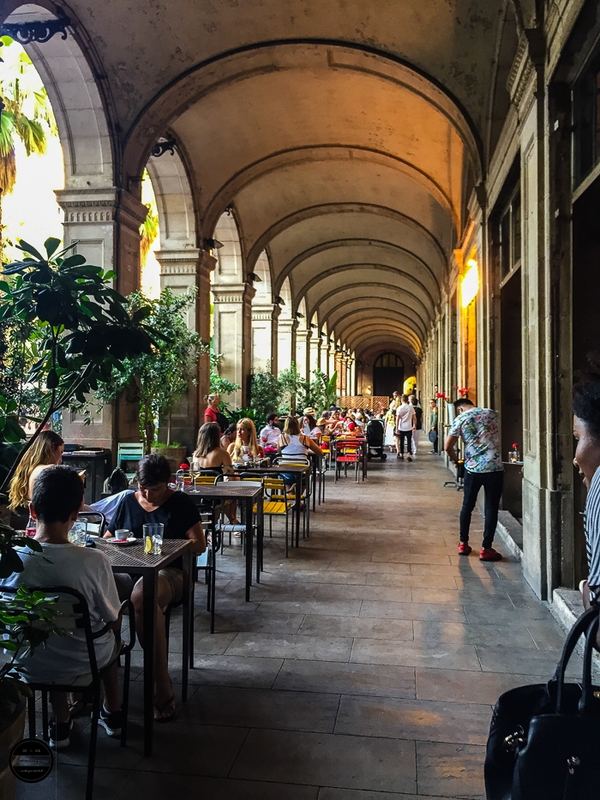 Barcelona is the perfect cocktail of rustic old charm and young cosmopolitan vibes. With lashings of Sangria thrown in. We flew in from London Luton to Barcelona - El prat on a 7 am flight. Neither of us was getting much beauty rest. 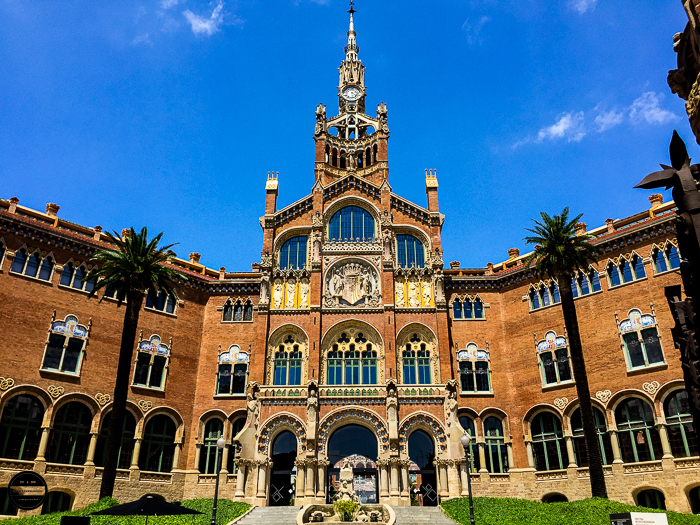 Upon landing at BCN airport, we bought 3-day (72hr) travel passes called Hola BCN. 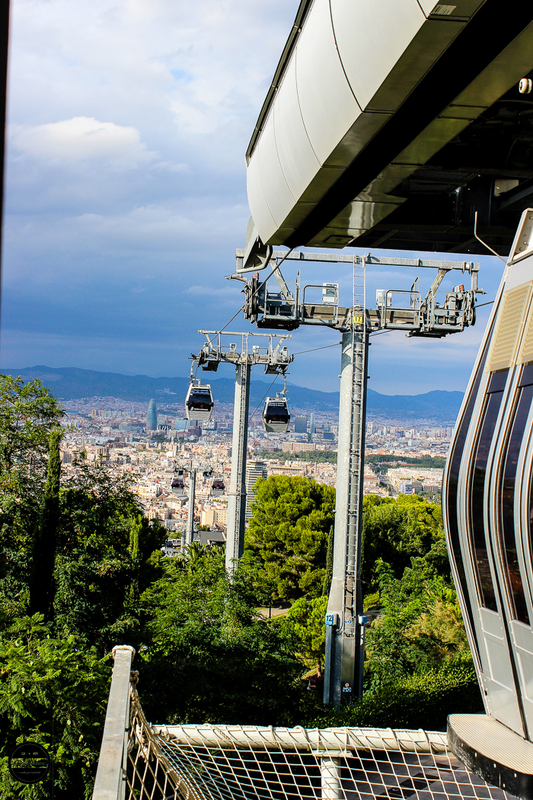 They could be used on unlimited on the metro, bus and other Barcelona public transport. The pass could also be used to get from the airport to the city via the metro. 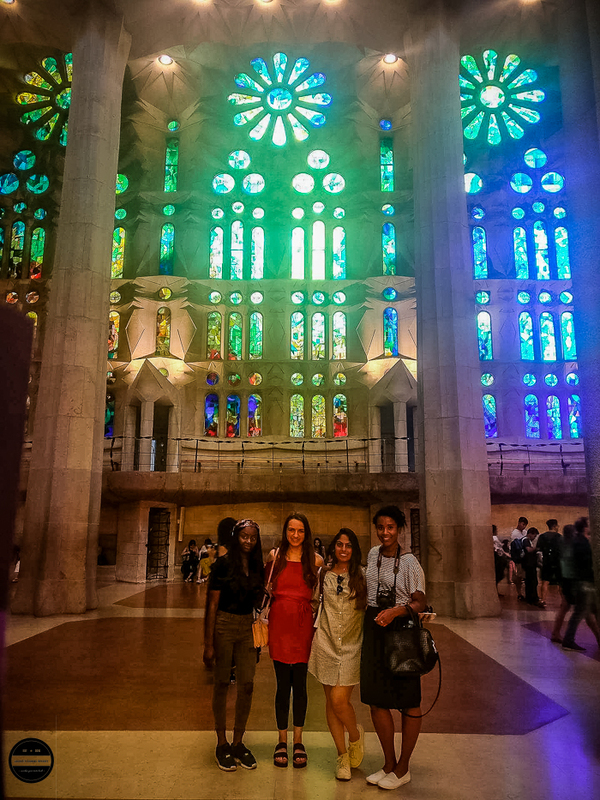 We took the L9 then changed over to the L5 to get to our accommodation 5 minutes from the Sagrada Familia. After dumping our luggage (always overpacked as girls) in our room, we were free to begin exploring the city! 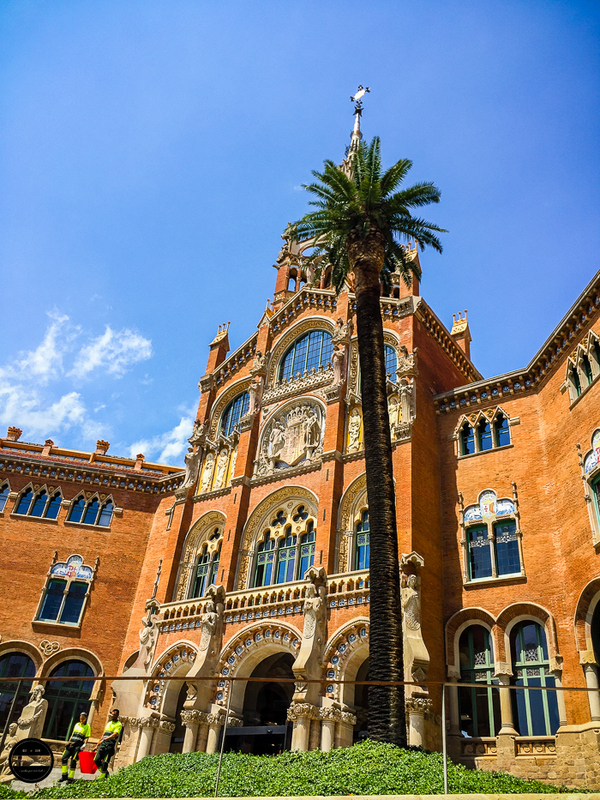 We were mere seconds away from the Hospital de Sant Pau i de la Santa Creu, a 15th-century building that used to serve as a hospital and now as a museum and cultural centre. There was no chance I was going to Spain without sampling the menu, so it was time to get some Patatas Bravas! Just from being outside for an hour or so was enough to experience the laid back attitude in Barcelona. I was enticed by the tables and tables of people enjoying tapas with a drink filling the streets. It's the kind of scene that is so hard to find back home in London. Now our next stop I was very excited about. We were going to visit the world famous Sagrada Familia. We bought tickets to the Sagrada Familia online in advance to save us from the long queues - I didn't want to take the risk of waiting around. If I thought the outside was spectacular, then I was in for a real treat once we made our way inside! Colours danced through the stained glass windows and added to the allure of the interior. If I had my way, I could have sat here for hours, gazing at the intricate detail of the architecture. 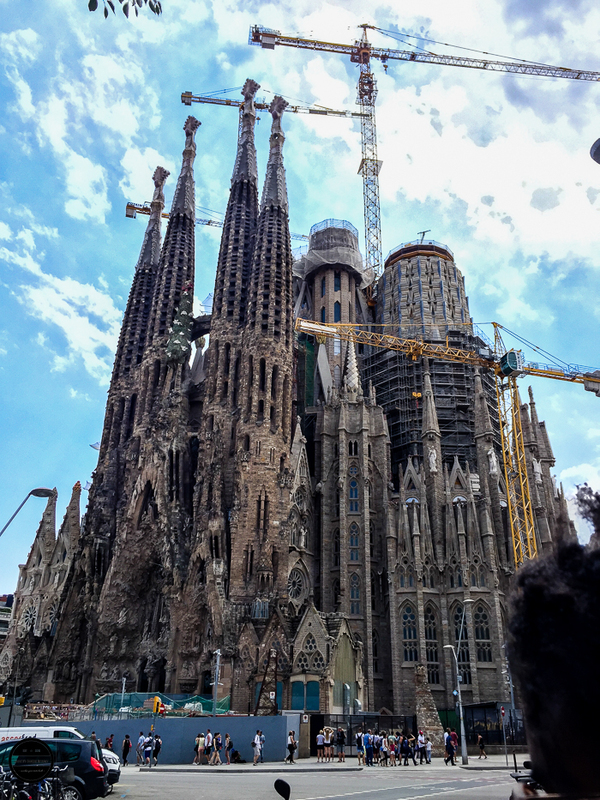 I was surprised to know that construction to the Sagrada Familia has been going on for over 100 years and is set to end in 2026. (An excuse to go visit again?) Even though it was packed with people, it still had a calming quality. Even though we were pretty jet lagged, we pushed on and made our way into the town centre by bus. I think the bus was one of the best ways to get around, we got where we wanted to be quicker than by foot but could still see all of the sights! We spent the rest of the evening walking along Las Ramblas, a vibrant promenade in the centre of Barcelona. I just couldn't get enough of the beautiful buildings, I took picture after picture ... it's times like this where having loads of memory cards to hand helps! The evening sun shone through the trees and cast gorgeous lights and shadows over each unique building. I fell in love with the balconies and couldn't help myself but stop and look - sorry to anyone behind me who had to put up with me stopping every couple of meters! We ventured into La Boqueria market which was an experience all in itself! It couldn't be more packed but it made the market all the better. We were overwhelmed with stalls selling fresh fruit, juices, meats. Wherever you looked was FOOD. So naturally, I had to buy something. I got myself an avocado and coconut juice to cool down and recharge from all of the walking. I also managed to get some pictures. Obviously. We walked around the town and squares late into the evening and finally found a spot to grab some dinner. The whole of the morning was taken up by a free walking tour which was a fantastic way to see the city! 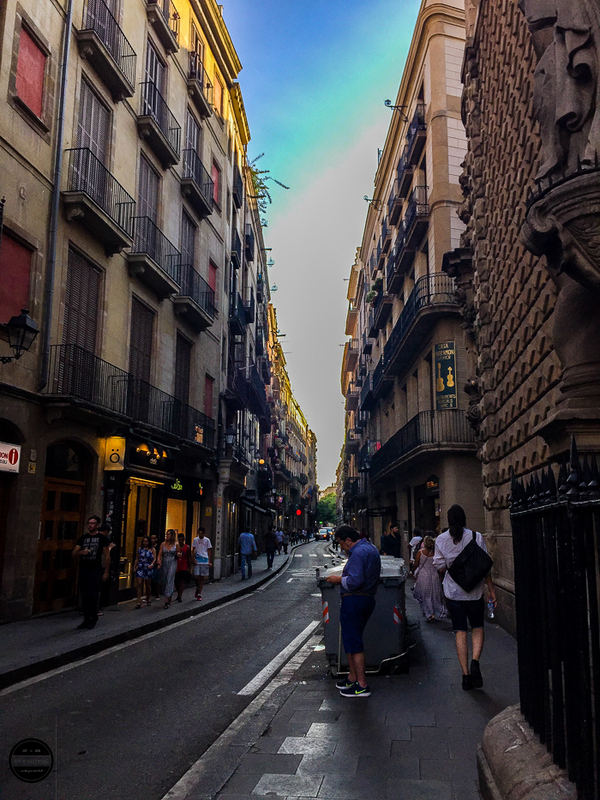 We explored the Gothic Quarter and I had the opportunity to learn more about the city I was in and its language. I ate my first paella in Placa Reial - a picturesque square lined with eateries just off Las Ramblas. 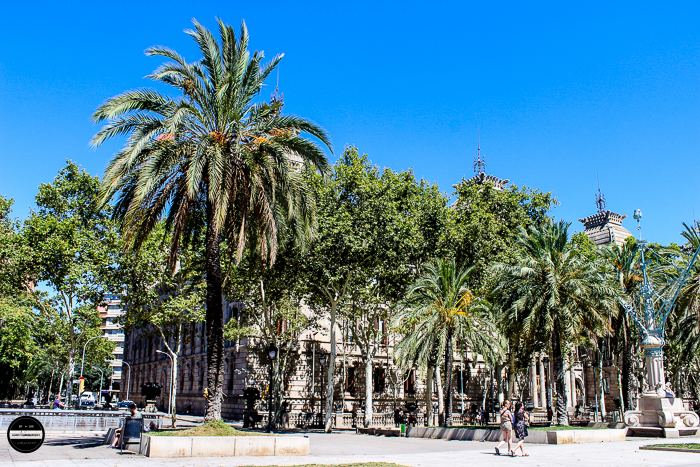 We decided then to take the metro to Placa d'Espanya which was within easy reach from Las Ramblas. I didn't know what to expect from this place but I was not at all disappointed. 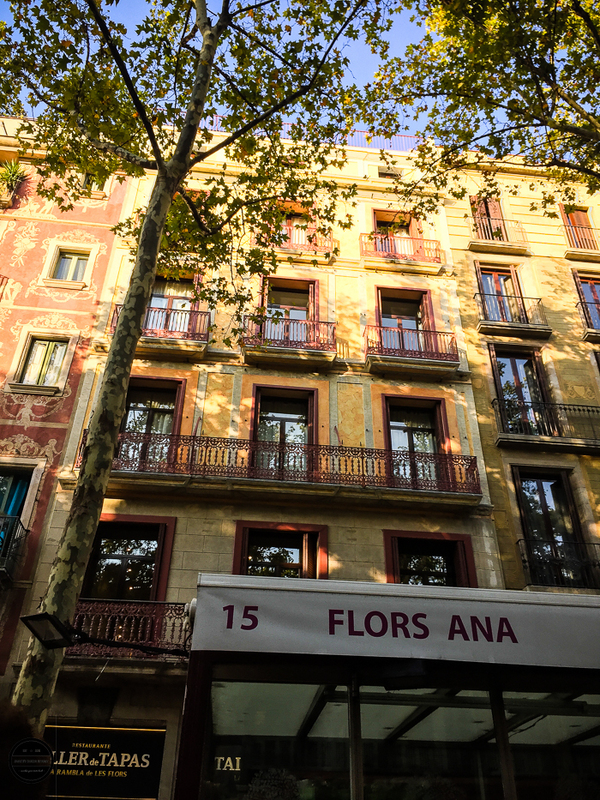 Far away from the centre, Espanya had a completely different feel. 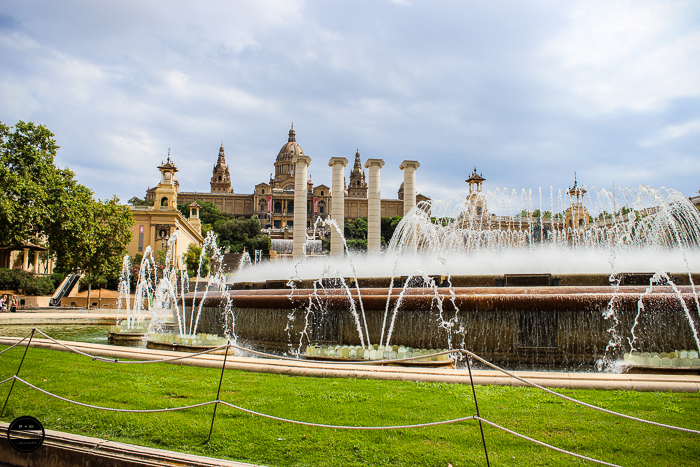 Just by walking up from the steps off the metro, we could see the Venetian Towers and the Museu Nacional d'Art de Catalunya (MNAC). We stopped to get drinks at the station. One glance at the menu and I knew what I was going to get. Horchata! One stop on the metro took us to the funicular for Montjuic where we could get on the Montjuic cable car to get panoramic views of Barcelona and the port. We took the cable car up one way and took a short leisurely walk back down again. 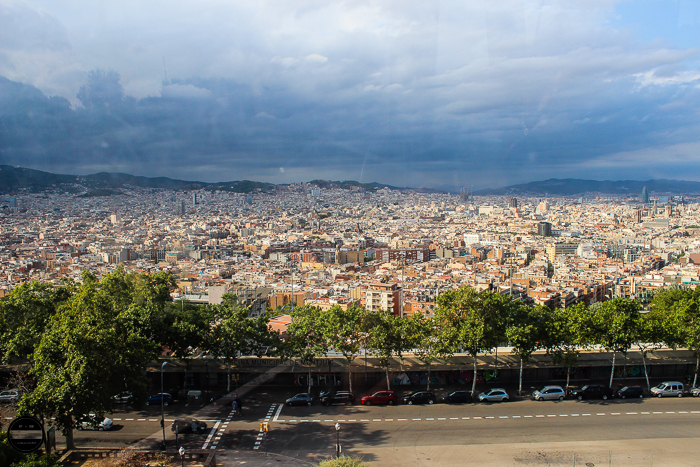 Seeing Barcelona from a height really helped give perspective on what we were seeing down on the ground. The Sagrada Familia stood out firmly. I had a really nice vegan dinner and then we had the evening free to head towards Barceloneta for the famous Barcelona nightlife! This was a girls trip after all and a chance to make use of my over flowing wardrobe back home! 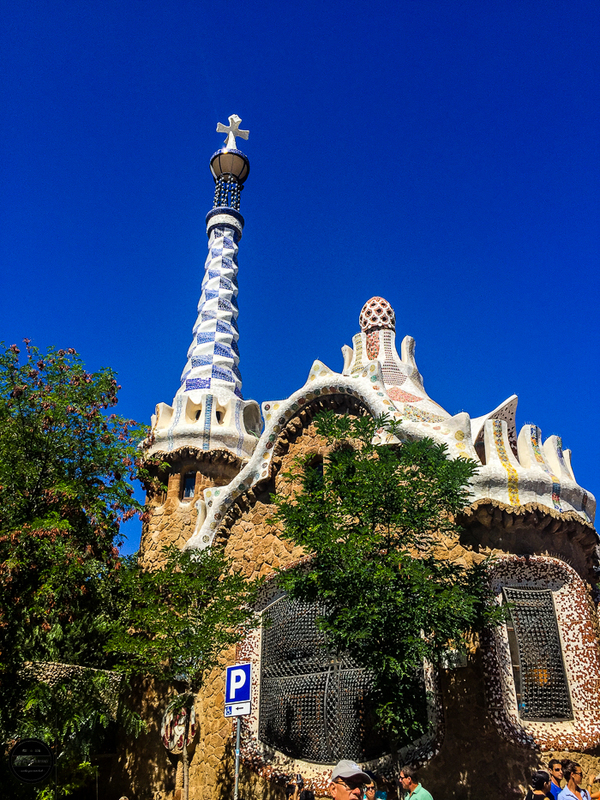 Day 3 began with a bus journey to Park Guell, a public park designed by Gaudi. It was simply beautiful. The clear blue sky contrasted seamlessly with the bright colours in the park. It was a hot day and we were tiring from our trip but that didn't stop us marvelling at the artistry at hand. 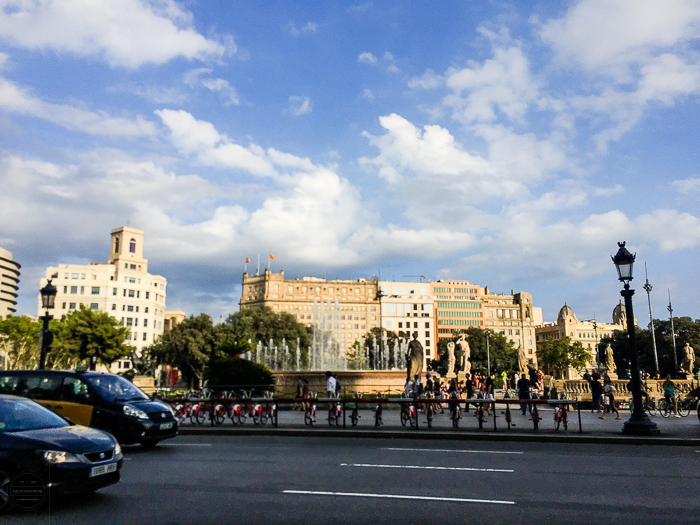 As we took the bus back to the centre, we passed Passeig de Gracia - Barcelona's high-end shopping street. My mouth watered looking at the pristine succession of shops that I wished I had more time to visit. One day I will return with an intention to spend, spend, spend. One of my friends suggested that we visit El Born for lunch. We left the hustle and bustle of tourist traffic behind and entered a calm oasis. 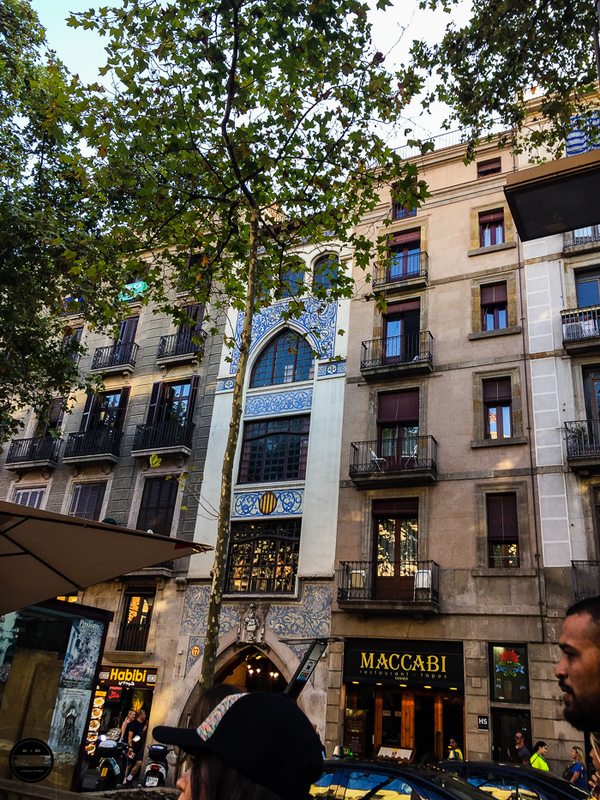 Narrow winding streets, rows of tapas bars and men playing Spanish music in the squares all added to the charm of El Born. My eyes were constantly wandering into the shop windows as I looked for props to bring back as gifts - I am a blogger's daughter after all! 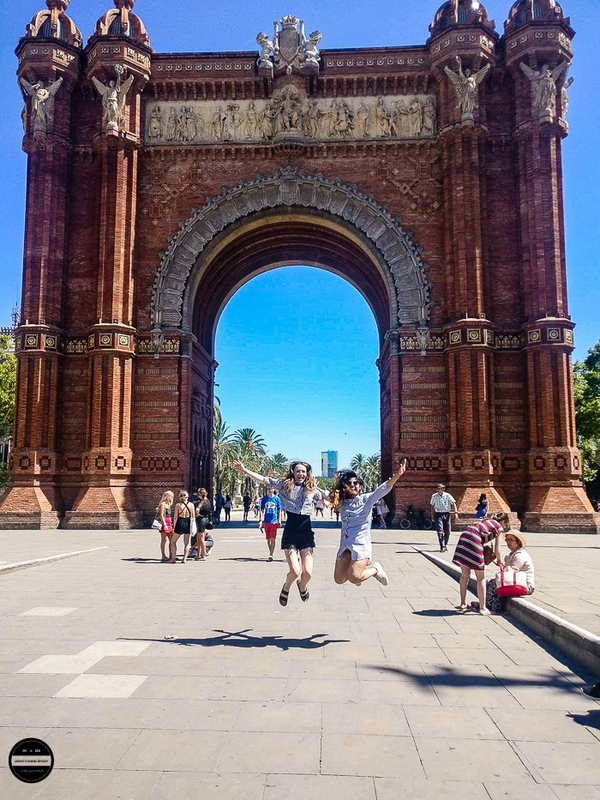 With plenty of time until our late evening flight, we walked to the Arc de Triomf (where a jumping photo is a given) then relaxed in the park next to it. We couldn't have asked for better weather as our trip began to draw to a close. 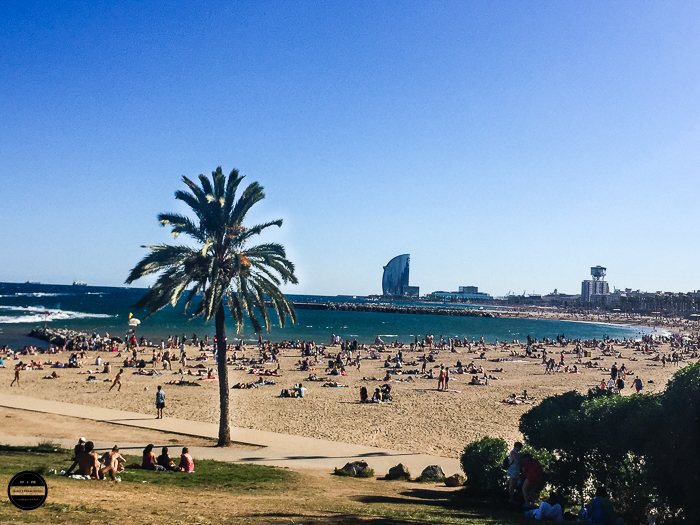 Next, we meandered our way to Barceloneta beach, ice creams in hand. Normally, when I see pictures of crowded beaches, it really puts me off! But walking along the promenade and simply soaking in the atmosphere was enough! Spending some time at the beach rounded this vacay off in style. Sadly, it was time to make our way back to the Airport to head home. But our love of the city lives on in the memories that we made... and the hundreds of pictures that we took! As I was adding the final pieces to this post, I heard the devastating news of the attacks in Barcelona on the 17th of August. I am shocked and saddened to hear that this has happened to such a beautiful city that is so full of life and energy. Barcelona is in our thoughts. This is indeed a beautiful account of your trip and it is making me want to visit Barcelona sooner than later. Its sad about the attacks in Barcelona. Wow amazing pictures in Barcelona!! The group picture with four of you standing facing the camera, is one of them Preashiny ? She has a canny resemblance to someone I know. Love the photos and the angles you have taken them in . All the pictures are so amazing and full of vibes . Hope you enjoyed alot there :) Thanks for sharing! Lovely photos, brought back memories ! Barcelona is really an amazing city. I’ve visited the city 3 years ago during a long weekend and looking at this post I realize how much places I’ve missed. I’ll keep this list in mind for a next weekend trip to Barcelona !! Barcelona is gorgeous than expected. City of tradition, culture and soccer. Really love this place. Beautiful pictures added more value to your post. I hope you really enjoyed the time in the city. Keep rocking! I'm jealous! Barcelona is in my travel bucket list. What a beautiful city! And I love your pictures. Thanks for sharing. What a beautiful post! 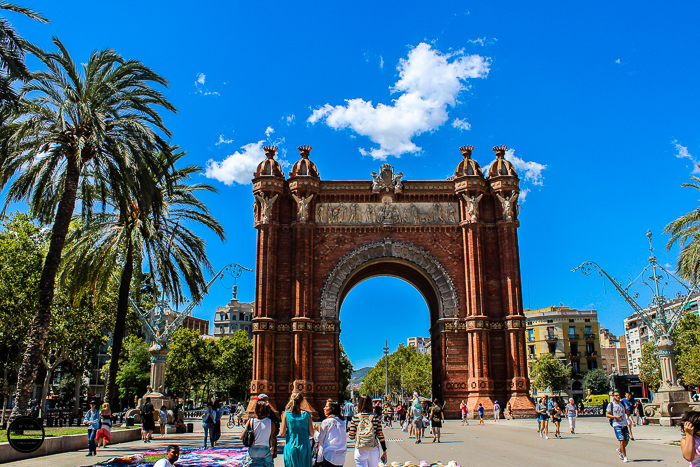 I´m living in Barcelona and I totally agree with you that it's an amazing city! I've always wanted to go to Barcelona. It looks like you had a fabulous time. I'd love to be on that beach. Wow you make Barcelona sound lovely and fun . Maybe I should consider it next time. And they are in our thoughts too. Barcelona looks absolutely amazing. I have wanted to visit Spain for quite some time and Barcelona will definitely be one my stops when I make it. Such absolutely gorgeous photos! I really hope I get the chance to visit someday. I would love to go for the food alone, but all that architecture looks incredible. Some amazing photos of a beautiful city. 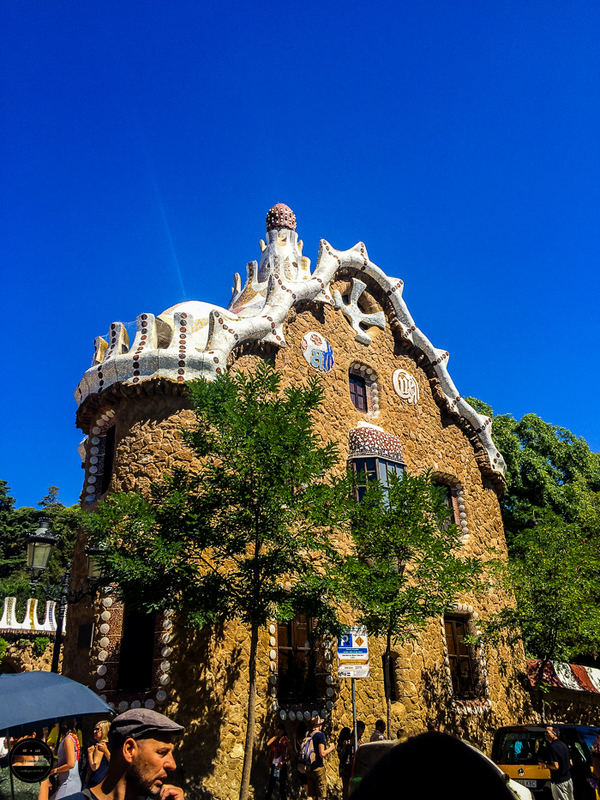 I love the Gaudi architecture and the shots you've taken of it. Your pics are amazing! I dream about visiting Barcelona in a near future! Beautiful pictures and many of my family members have been there and have insisted that its a must see place. Its really sad what happened on that day, but hopefully it will be back to normal soon and tourists will not stop visiting the beautiful city. What a co-incidence.. we also visited the beautiful Barcelona couple of months back. Nice write up. You managed to see so much in three days!! What a beautiful city. Loved reading baout the city and looking at the pictures. It was sad to read about the attacks in such a beautiful city. Hopefully, the city is back to normalnow. Oh you got to so some much in three days! Lucky you! I have never been to spain but i can tell the architecure is out of this world! you took some beautiful photos! Barcelona has to be one of my favourite city destinations! Ahhh, Barcelona is such a beautiful place, isn't it? I went about 15 years ago for the hen do of the first of my uni friends to get married. I would love to go back! Barcelona is such a beautiful city. Just love all the architecture! Absolutely stunning photos! We hope to call in to Barcelona next year during our holiday in a nearby resort in Spain as our daughter wants to visit. Now, so do we!! I really want to do Barcelona, more so after the terror attack-as I think you just can't let them win, we need to still go to places and explore the world. Next year, Barcelona!